Love is in the air! Are you looking for the perfect way to show your customers how much you appreciate them (a way that perhaps doesn’t include sending a dozen roses!)? Why not show them some love by giving them a chance to win a gift card from your business, admission to a show, or all the fixings for a perfect date? I’ve come up with six suggestions for Valentine’s Day marketing campaigns, including three real examples from ShortStack customers. Valentine’s Day is the perfect time to “get back on the horse” with your online marketing after the holidays. As you’ll see, you can leverage a holiday like Valentine’s Day to increase your brand awareness and help build your email marketing list for remarking purposes down the road. Seasonal promotions are a fun way to get your customers excited about your products. Take the heart-shaped biscuits at Tudor’s Biscuit World, for example. Every year on February 14th, Tudor’s bakes heart-shaped biscuits — a promotion their customers look forward to. This year, Tudor’s fans can upload a photo of themselves or their families enjoying this year’s heart-shaped biscuit in exchange for a chance to win a $25 Tudor’s gift card. Folks can only submit entries on February 14th and 15th, creating a sense of urgency around the promotion. Plus, everyone’s a winner with this contest, as each entrant receives a Tudor’s coupon after submission. I think this campaign from Tudor’s is brilliant. It allows them to collect valuable user-generated content (UGC), as well as grow their email list. If Tudor’s asks entrants for the digital rights to the images they submit, then the UGC can be used by the brand to promote their restaurants across their social media platforms and wherever the Tudor’s team would like to use the images. 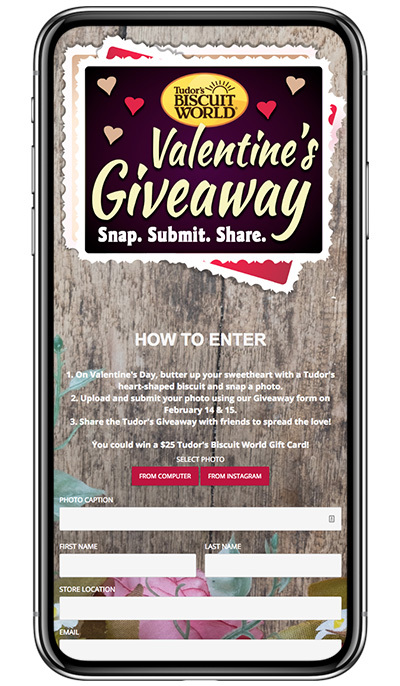 With the email addresses Tudor’s receives for this contest are perfect for remarketing purposes; after all, these folks have already proven that they are Tudor’s customers by going to the restaurant on Valentine’s Day and snapping a photo with Tudor’s biscuits. Choosing a Valentine’s gift can be hard, so make it a bit easier on your customers with a quiz to help them pick the perfect gift. Ask quiz-takers questions about their significant other, then present them with a gift option or two after they submit their name and email address. For example, a jeweler could ask about someone’s style (classic, edgy or laid-back), the color they tend to favor (warm-tones, cool-tones or neutrals) and the size of their jewelry collection (non-existent: they don’t have a lot of jewelry, moderate: they have the basics covered or extensive: they are always trying a new piece). Then, the quiz would generate an outcome based on the respondent’s answers. It would be good to include several options within each outcome to fit several budgets — especially when it comes to jewelry. Don’t forget to send an email to folks who take the quiz that includes their result, along with a list of all the gift ideas that you included in the campaign, where folks can go to buy them, and maybe even a coupon to your store. There’s a trend toward giving experiences and not “material” things as gifts. 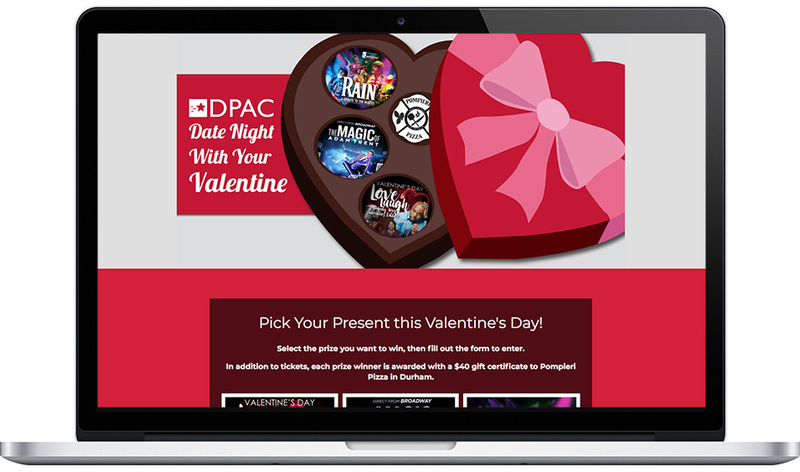 Durham Performing Arts Center (DPAC) created a campaign where a winner receives a date night with their Valentine. To enter, folks just choose which of three DPAC events they’d like to attend and then fill out the form. Winners are chosen for each of the three events. The campaign co-sponsor, Pompieri Pizza, is chipping in a $40 gift card for each winner, completing the date night experience. 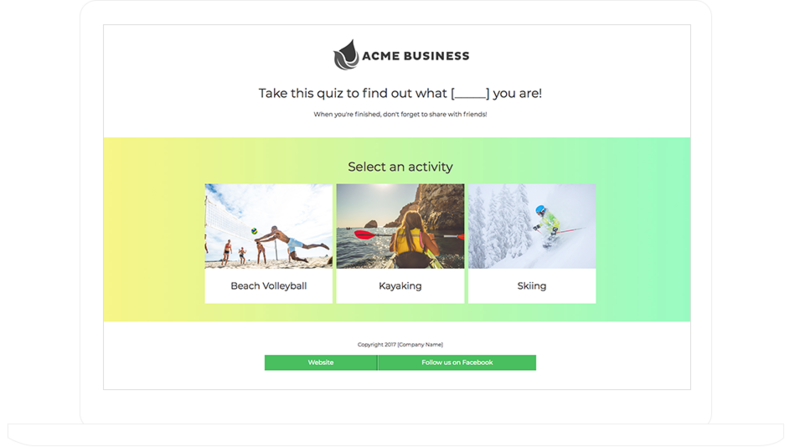 A Pick Your Prize contest allows you to engage with your customers and grow your email marketing lists, plus you can conduct valuable market research. Using the DPAC campaign as an example, they have three different types of events they are giving away — a comedy show, a magic show and a rock concert. If they find that most folks are choosing the comedy show and the magic show are much more popular than the rock concert, then they might consider adding more magic shows and comedy shows to their line-up in the future. I can guarantee Instagram will be full of couple selfies celebrating their love on February 14th. Why not give people the opportunity to enter a contest at the same time? Ask folks to include your contest hashtags when posting their Valentine’s Day selfie to submit an entry. Something simple, like #vday2018 #[YOUR_BRAND_NAME] should do the trick. Hashtag campaigns help raise brand awareness. How? Not only will the people who are interested in entering your contest be posting their entries to their personal profiles, but their friends will see those posts. Some people might click your contest hashtag to see what your campaign is all about and enter the contest themselves. Also, if you are using a popular hashtag as one of the hashtags you require to enter, folks who are viewing the posts in that hashtag will also wind up viewing entrants’ submissions to your contest. Make your business part of your customers’ best memories. How? Try giving away a VIP-customer experience. Check out the DiBella’s Subs’ “Love DiBella’s” contest. 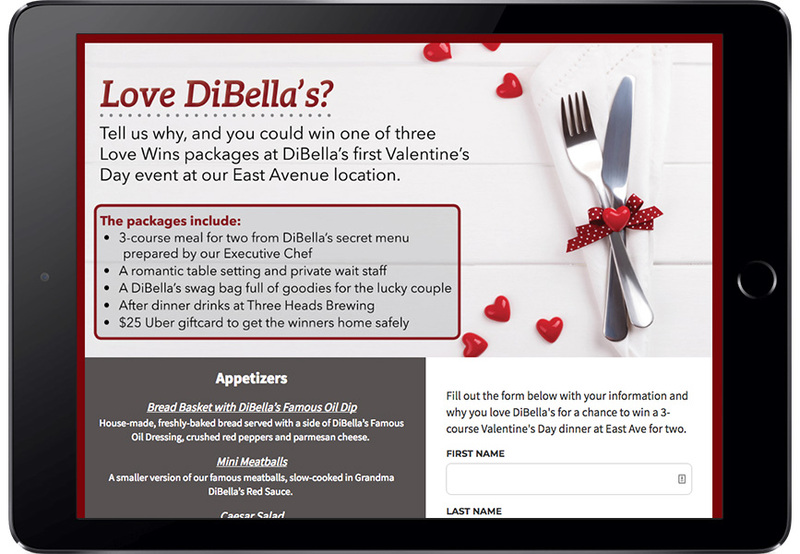 They create a complete date-night package, including a three-course meal from their secret menu, a romantic table and private wait staff, plus other DiBella’s goodies. To top it off, DiBella’s also covers the tab at a local brewery for after dinner drinks and the Uber home. IDEA: Use our Form Field Points feature (available on the Agency Plan and higher plans) to award entrants with extra points for filling in optional entry form fields. People don’t like filling out a lot of fields to enter contests, so incentivizing folks to submit additional information is a smart idea. It allows you to keep the required fields for entry short, but it increases the chances that people will fill out the optional fields. Is your restaurant a popular date-night spot for couples or are you hosting a Valentine’s Day event? If so, you NEED an online reservation form! 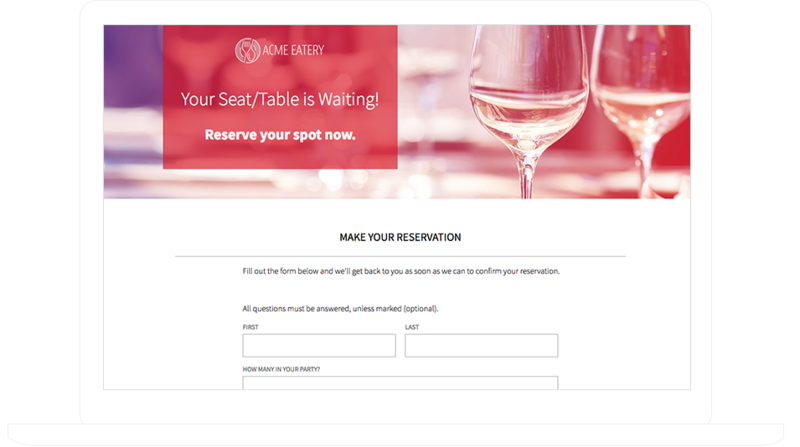 Online reservation forms are simple for people to use and they don’t require you to be tied to the phone all day. Once someone submits a reservation request, you can check your reservation system to see if the date and time they requested is available. If it is, respond to them noting that their reservation has been confirmed, and if not, send them an email with the bad news and some alternative dates and times. I suggest noting a cut-off time for reservations to be submitted each day. For example, same day reservations must be requested before 3pm, with confirmations to be sent out by 4pm. This gives you enough time to respond to folks before dinner service begins and the people who aren’t lucky enough to score a table enough time to find an alternative date-night spot. TIP: Our paid plans give you the option to receive admin email notices when you receive a form submission — learn how to set them up. Rome wasn’t built in a day and neither was your customer base. You can’t just run online campaigns once a year during the holidays and expect folks to keep coming back to your business throughout the year. Persistence is key. Make things easier on yourself and take advantage of holidays like Valentine’s Day to grow your email marketing lists and boost brand awareness. Better yet — create a 12-month online marketing calendar. If you have any questions along the way, just shoot us an email at theteam@shortstacklab.com.